Jersey Lilly Saloon...and courthouse of Judge Roy Bean in Langtry, Texas. 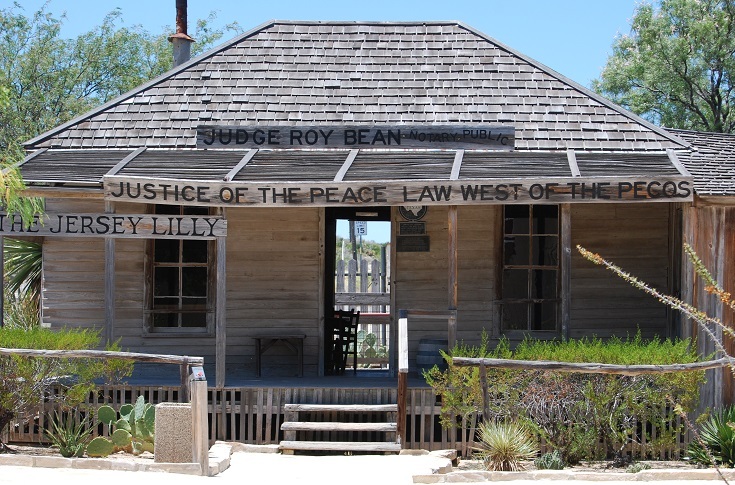 Even the historical markers in southern Texas state that it's hard to separate fact from fiction when it comes to Judge Roy Bean, the self-professed only "law west of the Pecos." Whether the following death sentence was ever handed down by Bean is murky. Notoriously famous as a hanging judge there is scant evidence that he ever sentenced anyone to death. If he did, there is no evidence that the sentence was carried out. What cannot be denied is that the sentence reads as poetic justice. in a few short weeks it will be spring. the air will become soft and balmy. will awaken and come to pass. But you will not be there. its soaring course to the sea. will put forth their tender shoots. will blossom as the rose. Still you will not be there. some wildwood songster will carol his mating song. Butterflies will sport in the sunshine. and all nature will be glad. But you will not be there to enjoy it. and let you hang until dead. There wasn't much to Langtry,Texas at the turn of the last century and there isn't much there today. But what was there has been preserved and that includes the saloon that also served as the court of Judge Roy Bean. Bean — the man, the myth — served as justice off and on from 1882 until his death following a night of heavy drinking in the saloon in 1903.